They are totally cute & I can see why Lucy chose all three! Thanks for the link, heading over there now! You REALLY like colour don't you Zooty Owl !!!! lol! They are BEAUTIFUL !!! Your patterns are gorgeous! How lovely to be part of Yarndale! Just need to decide which of your patterns to use! Wonderlik mooi, ek sien jou goed in nou die hele internet vol, Pinterest, ens ens. Are you collecting for Yarndale? It is not a stupid question at all Diane! A (according to Wikipedia) Mandala (Sanskrit: मण्डल Maṇḍala, 'circle') is a spiritual and ritual symbol in Hinduism and Buddhism, representing the Universe. They make brilliant doilies, placemats, trivets, round cushions and bags, and with a bit of ingenuity can be turned into clothing pieces too!! So interesting to make up, love the 'twist stitch' and the braid effect on the border, great new stitches to try out! 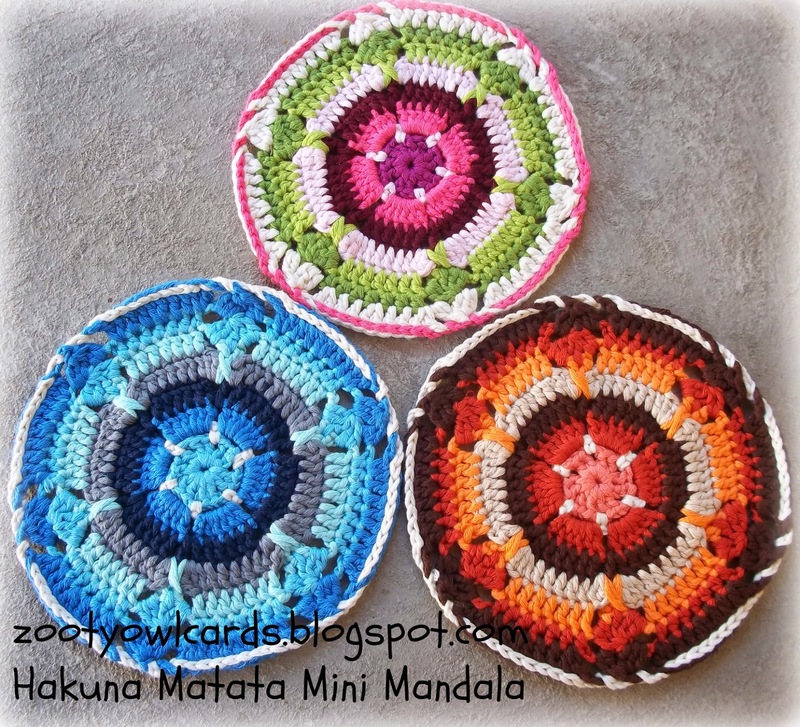 Gorgeous mini mandala's. Beauiful designed by you and so nice they picked all three designs. Thank you! Hakuna Matata is Swahili (spoken in East Africa) and it means "No Worries"! There are 7 people who organise Yarndale. There were also a myriad of helpers and volunteers on the day and in the lead up. It's just that one person takes all the credit. A bit unfair really. Without the people who made the bunting and the mandalas, who strung the bunting together, who posted their contributions from around the world, to those who volunteered their services on the day itself for little thanks or acknowledgement, there would not be a yarndale worth visiting. It's a shame credit isn't given where it is due. It's a commercial concern not a charity, so you would think that is the least that would happen by the organisers, who are all just a bit quiet with their thank you's. I'm afraid it all seems rather greedy and in bad taste to me.